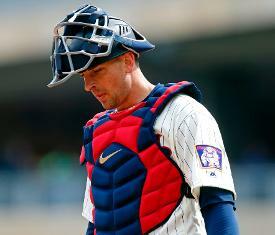 Minnesota Twins catcher Jason Castro will miss the rest of the season after knee surgery Tuesday was more extensive than expected. Twins manager Paul Molitor told reporters prior to Wednesday's game against the St. Louis Cardinals that doctors did a complete repair of Castro's torn meniscus. The plan prior to surgery was to remove the torn portion and for Castro to miss four to six weeks. "The tear was a little bit more significant," Molitor told reporters. "They decided to try to keep what he had left. They thought that was the best course of action for him as far as prolonging his career and productivity." Castro, 30, has had issues with the troublesome knee. He missed the entire 2011 campaign after tearing the anterior cruciate ligament and also had arthroscopic surgery on the knee in 2013. The latest development means Castro played in just 19 games this season. He batted .143 with 26 strikeouts in 63 at-bats. "He's looking at a long rehab," Molitor said. "Jason was made aware the day before that when you get in there this is always a possibility. He was on board if they had to do what they had to do -- that he wanted to protect his future." Rookie Mitch Garver and journeyman Bobby Wilson are sharing the catching duties for the Twins.